See your state schedule page for specific timings. Settlers rounds will be played using the base Settlers game. A random setup of tiles will be produced by the judge just prior to the commencement of each round. The tournament is ruled by at least two referees. If rules are broken at a table players have to call for a referee immediately. The ruling of a referee is final and players have to accept the decision. If a broken rule is not reported to a referee players accept this as a regular play and therefore accept the game to be rated normally. If players do not agree with the outcome of a game due to broken rules or unfair play, they have to immediately call a referee - once the record sheet of the game is signed protest is not possible anymore. If a player is not willing to give his signature a referee has to decide about the game. The referees can disqualify players from the tournament if the rules of the game are broken on purpose by a player with the intent of winning the game. The disqualification can only be made during a running game or immediately after finishing a game. A disqualification is not possible once the tournament is over. For all games the organiser has the choice to introduce a time regulation. This limits the time for a turn to three minutes. No games will be ended by the organiser before one player has reached 10 victory points. The tournament will feature 4 rounds of play for all players with the basic game. All game will be played with the American version of the game (just the basic game). Therefore the official tournament language is English. There will be a prefixed schedule, which determines at which table and which starting positions the players play in each round. The four winners of the semi-finals reach the final of the Catan Australian Championships. Once again the players choose their starting positions according to their ranking from the first day. In the qualifying rounds of the tournament each game winner will be granted 4 placing points for a win. Placing points of three for 2nd place, two for 3rd and one for 4th place will then be awarded. In the case of a VP tie placing points will be shared equally. The sum of these placing points will form the first tie break. Players equal on VP points with the winner are only eligible for 2nd through 4th placing points. In case of ties, the total number of victory points reached by the players will be used as first tie-breaker. If there are still any ties, the next tie-breaker will be the sum of the percentage of victory points the players reached at their four tables. If there are still any ties after that (which has never happened so far) lots will be drawn. Players A and B both win 2 games. Both get 28 victory points - so there is still a tie. Now the percentages of victory points will be calculated. Game 1: A gets 10 VPs, there were 32 VPs at the table, so his percentage is: 31.25%. Game 2: A gets 8 VPs, there were 30 VPs at the table, so his percentage is: 26.67%. Game 3: A gets 10 VPs, there were 36 VPs at the table, so his percentage is: 27.78%. Player A's total is: 85.70%. Game 1: B gets 10 VPs, there were 30 VPs at the table, so his percentage is: 33.33%. Game 2: B gets 10 VPs, there were 33 VPs at the table, so his percentage is: 30.3%. Game 3: B gets 8 VPs, there were 36 VPs at the table, so his percentage is: 22.22%. Player B's total is: 85.85%. Therefore player B is ranked higher than player A. The board is set up by the players at the table as per the random set up drawn by the Tournament Director as described in the almanac. All the material has to be kept on the table all times - so it is clearly visible for all players. This is especially true for development and resource cards, which must be held above the table all the time. In all games (with the exception of the final) the starting player will be in charge of the giving out and receiving resource and development cards. They have to comment clearly when he is handing out cards to themselves or when he is paying resources to the bank. Newly bought development cards have to be kept well away from the other cards the players has in hand. If a player breaks this rule they forfeit the opportunity to play a development card until their next turn. 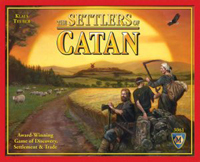 All of the following rules are additional rules to the Catan Standard rules. Where contradictions occur refer to the rules laid out below, as used in the Catan Australian Championships 2006. The turn of a player starts with throwing the dice, but a development card may be played before that. Dice must be rolled inside the box lid. It is not permitted to build a road beyond a settlement (or city) of another player. It is possible to upgrade a settlement to a city in the same turn it was built. To do that the player of course cannot have five settlements on the board before building the settlement he wants to upgrade. If a player buys a development card with a victory point on it, they may immediately reveal it if this is their tenth victory point to win the game. This is only possible with development cards that have a victory point printed on it. It is not allowed to immediately play a soldier/knight even if this would mean getting the largest army and win the game - the player still has to wait until his next turn before he can play the soldier/knight. There is no distinction between the trade and building phase. A harbour may be used in the same turn it was built. A player has won as soon as he has 10 or more victory points (although only 10 will be counted for the ranking) and it is their turn. If they do not notice they must wait until their next turn before they can win the game. If there are not enough resource cards of one kind to give every player the resource cards they should get after rolling the dice, then nobody will receive a card of this kind. The other resource cards are handed out to the players as usual. A road broken by an opponents settlement/city does not count towards longest road.